The Centre has evolved a plan to impart technical skills to 50 crore youths by 2022 to address the critical issue of unemployment and create a human resource pool. 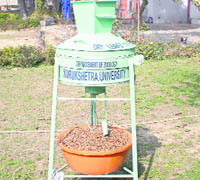 Prof Rajneesh K Sharma and Satendra K Yadav, Department of Zoology, Kurukshetra University, have invented a machine to obtain green manure from dead leaves. They have named it — “Dry Leaves Manure Maker”. A patient was allegedly shown the door by the general hospital authorities here because the staff in the emergency ward found his clothes and bedding stinking. Students of Government Dental College, Rohtak, have secured the top two slots in the All-India Postgraduate Medical/Dental Entrance Exam held recently. The Indian National Lok Dal today held a demonstration in the town against, what it called, “corruption at the government level, scams, shady land deals in Haryana and rising prices of essential commodities”. Now, reporting illegal sale of Liquid Petroleum Gas (LPG) cylinders in Sirsa will fetch a cash prize of Rs 1,100. The Gurgaon police has arrested a Delhi-based woman and a Nigerian man on a charge of defrauding several persons in the name of getting them jobs in Maruti Suzuki India, a leading automobile company of the country. This was disclosed by Union Minister of State for Science and Technology Ashwani Kumar while addressing the third convocation of the Guru Jambheshwar University of Science and Technology here today. He said this would be a Herculean effort and in the years to come India would have a large pool of young men and women with employable skills. He said the Centre had decided to set up an academy of scientific and innovative research with powers to award degrees, and a Bill for the purpose would be introduced in the forthcoming session of Parliament. The minister disclosed that the Department of Science and Technology, Government of India, had launched the Innovation in Science Pursuit for Inspired Research (INSPIRE) to encourage the youth to pursue science and build a human resource pool and research and development base in the country. Under this programme, 3.07 lakh awards worth Rs 153.25 crore had been sanctioned. These included 4,500 awards for pursuing BSc and MSc degrees and 499 fellowships for pursuing the PhD degree. “We face daunting challenges in areas of food production, water, health, energy conservation and environment protection which await scientific and technological solutions. The foodgrain production growth in the country has shown an average growth of 2 per cent per annum during the past 10 years. To keep pace with the food requirements of a growing population, we need to explore the use of technologies and research,” he added. He said while we needed to maintain a high economic growth, we could not be oblivious to the critical challenges of sustainable development, malnutrition pandemic, deprivation and the absence of health care. Scientists are, therefore, naturally expected to play a larger role in meeting these challenges. Chief Minister Bhupinder Singh Hooda said the need of the hour was to have a knowledge-based society as the future belonged to knowledge and education. Those states which did not realise the importance of education would certainly perish. He said during the past six years, 430 technical institutions had been opened, taking the number to more than 600. While the number of seats in these institutions had increased by more than 1.29 lakh, the budget for technical education had registered a manifold hike. 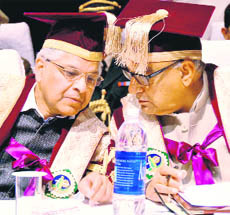 Haryana Governor Jagannath Pahadia, who is also the Chancellor of the university, said he would like the graduates to create awareness among the masses about environment, ethics, social equality and justice. The Chancellor gave away 1,202 degrees, including 162 PhD degrees. As many as 217 students received gold medals. The machine, which can be of great help to marginal farmers, orchid owners, municipal committees and other organisations, will help reduce pollution, space requirement and manpower. Lt-Gen DDS Sandhu, Vice-Chancellor, Kurukshetra University, has congratulated Professor Sharma and Yadav for the invention. Prof Sharma told mediapersons here today that by using this technique, the volume of leaves would be greatly reduced and heaps of leaves could be packed in gunny bags. They could be used as manure or converted into vermicompost or organic manure as per the need of the farmer concerned. “This technique is the quickest of all existing methods of generating green manure. This is eco-friendly, wherein no smoke or harmful gases are released during the disposal of dead leaves and litter, and thus helps reduce pollution. The machine will chop leaves and increase the surface area of the leaves for the attack of microbes for faster degradation,” said Professor Sharma. The disposal of dry leaves and plant litter is not an easy task. The major problem is that dry leaves cover a large area and can catch fire. Dry leaves are often burnt to clean space. However, this results in the production of a large number of toxic gases like benzopyrene, carbon monoxide, carbon dioxide and nitric oxide, which get released into the environment, causing a number of health problems like asthma, breathlessness, burning of eyes, irritation of throat, allergy and even cancer. These gases also influence the surrounding green vegetation. Another method used traditionally was burying leaves in pits where these get converted into manure. However, in this method, a lot of space was required for the disposal of dry leaves. It was also a labour-intensive process, wherein collection of dry leaves, digging of pit, burying of dry leaves and then digging out the same site for the collection of manure required manpower, he added. The victim, Gurdial (35), a resident of Mohamadpur Rohi village, who was admitted to the hospital last evening due to injuries sustained in a quarrel, had to lie on the lawns outside the ward. His mother, Kulwant Kaur, alleged that when she and some other women of the family came to the hospital with some clothes and bedding for the victim in the emergency ward, a doctor and a nurse shouted at them. She said the nurse asked them to get out of the ward as their bedding was stinking. As the victim’s mother was narrating the incident to mediapersons, the Deputy Civil Surgeon, Dr HL Gupta, reached there and lodged the patient inside the ward again. He said he had been asked by the Civil Surgeon, Dr OP Arya, to look into the matter. Dr Gupta maintained that the victim’s family had created a scene for no reason. He added that the patient had not been cooperating with the doctors and had not been undergoing tests advised to him. He said the victim was advised X-ray yesterday, but he refused to pay for that. He said the patient’s family was a pink cardholder (living below the poverty line) and he wanted his X-ray and other tests to be done free of cost. Dr Rohit Kansal of the college has secured the first rank while Dr Ajay Kumar has got the second position in the test. This is the second consecutive year when the students of this institution have secured the top rank in the test. Dr Ruchi Juneja had secured the first rank in the exam held last year. According to Dr Sanjay Tiwari, Principal of the college, as many as 15 students of the college have got high ranking this year. He said Dr Amita had secured the sixth rank while Dr Sumidha, Dr Surya and Dr Reena got 16th, 20th and 21st rank, respectively. He said Dr Sunita of the college had got first rank in the SC category while Dr Kamal Sagar stood at the third place in the All-India Postgraduate Medical/Dental Entrance Exam 2011. The Vice-Chancellor of the health university Dr SS Sangwan has congratulated the students and the faculty of the dental college. The Dental College, Rohtak, has been ranked amongst the top 10 colleges of India in a recent survey. Ajay Singh Chautala, secretary-general of the INLD and MLA from Dabwali, led the demonstration. Party activists first assembled in the grain market, where Ajay Singh and other local leaders of the INLD addressed them. The protesters later marched in procession towards the mini-secretariat, where the party submitted a memorandum, addressed to the Governor, to the district authorities. Addressing the workers, Ajay Singh alleged that the magnitude of the recent scams proved that the present UPA government at the Centre and the Congress government in Haryana were the most corrupt governments so far. Accusing Chief Minister Bhupinder Singh Hooda of ruining farmers of the state by acquiring their agriculture land to benefit builders and colonisers, Ajay Singh alleged that thousands of acres of land had been taken away from farmers in the past six years. Through their memorandum, the INLD leaders sought a thorough inquiry into all land deals in Haryana. The district authorities today started this unique scheme to find a solution to the shortage of LPG cylinders in the district. DC Yudhvir Singh Khyalia announced this while presiding over a meeting of the officers convened to evolve a strategy to check the sale of gas cylinders on the black market. He said the authorities would keep the names of the informers secret. Surprise checking would be made to check the record and functioning of the gas agencies working in the district. Teams of officials had also been constituted under the Sub-Divisional Magistrate at sub-division level and under naib tehsildar at the sub-tehsil level. The teams would monitor the activities of the gas agencies and check their records periodically. The DC said anybody could give information to the Sub-Divisional Magistrate or the naib tehsildar concerned . The DC directed the officers of the Food and Supplies Department to check the record of the agencies. Gurgaon Deputy Commissioner of Police (Crime) Mitesh Jain said the arrested persons were produced in a local court yesterday. The court sent Pooja Rai of Munirka Vihar in Delhi to judicial custody for 14 days and Nigerian national Teddy Malon Ogboru to police remand. The matter came to light when some persons who had been charged money in the name of processing their job applications at Maruti approached the company authorities. Following this, the Maruti Suzuki India vigilance manager, Capt Sanjay Mathur, lodged a complaint with the police in this regard. 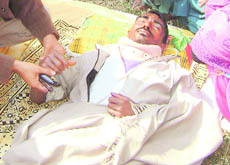 The case was handed over to the crime branch of the Gurgaon police. Inspector Gaurav Phogat, who heads the cyber cell of the local police, investigated the matter and found that the accused used to send false e-mails to jobseekers, informing them that their name had been shortlisted for some job in Maruti. “Then, they used to ask the person to deposit a certain amount, ranging from Rs 5,000 to Rs 15,000, in some bank account in the name of processing their applications; and used to withdraw the money through ATMs,” the DCP maintained. He said the accused employed fraudulent means for getting bank accounts as well as mobile/Internet connections. They created fake e-mail addresses to trap their targets, he added. Jain conceded that the interrogation of the Nigerian national could lead to some more disclosures.